We work with clients from all over USA and Canada, so if you are unable to visit our showroom then do not worry. We have a custom rugs kit that includes wool color poms and small rug samples that show the different qualities, materials, pile heights and finishes available. by size and style to help you choose a design for your custom rug, or email us a design you have. The client wanted a beautiful Asian design in a very subtle rug; we designed this rug based on her instructions. We made this subdued grey transitional rug for our client who wanted a transitional rug in the colors and size their space needed. Our client loved this Native American design but those rugs only come in smaller sizes in flat weave rugs and the client wanted a room size rug in a plush hand-knotted weave. We designed this beautiful modern rug based on the design criteria given by our client, the result was absolutely wonderful. We did the entire house for this client with our beautiful rugs, but this one hallway was a major challenge. The size was wide and over 30 feet long and there are very few runners in such a size. The client also was very specific in the design and colors they like, and the rug had to compliment an existing rug. So custom rug was the only choice. This client had very specific desires for the design and colors of their rug and we couldn’t even find what they wanted in our 5000 plus in stock rugs.So we went to the drawing board and after a few iterations of design and colors, we had a winner. We designed this to satisfy our client’s needs for a specific size, design and color palette. The client saw a beautiful traditional Gabbeh design rug and wanted a contemporary version of that look. We created this gorgeous rug to satisfy their very specific taste. The client fell in love with a rug in our showroom and wanted it in a larger size with their colors. The beautiful design utilizes very traditional motif’s in the creation of this contemporary design resulting in a transitional rug. This complex designed rug has incredible carving to accentuate the intricate design. just like the 2 rugs shown above the we created for our clients. At Alyshaan, we are a three-generation family business. What began from my father’s dedication and love for artfully handmade rugs, is now carried on by my son, myself and a highly talented staff of 9 people. Welcome to our family. We have a certain degree of pride in how well we have been reviewed over the years. With stellar reviews from Google, Houzz and Yelp, you can be assured that you will receive the best in service. 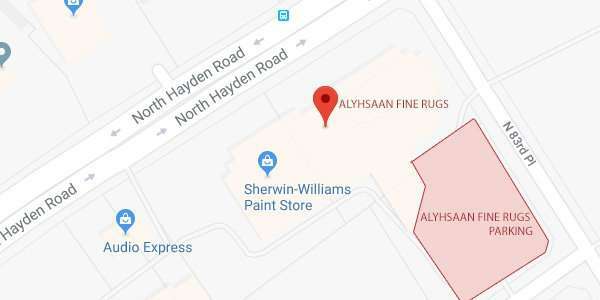 At Alyshaan, we want your rug shopping to be a magnificent experience. Alyshaan Fine Rugs proudly shares images of custom rugs designed by clients using our special custom rugs design service and proprietary Alyshaan software. Creating a custom rug gives the opportunity to create a one-of-a-kind original art piece for your home that embodies your taste, design, feel and palette. The color choice rivals the rainbow and there are endless variables to choose from such as: material types, carving and pile height, all of which can be modified to create the exact piece that you desire. Our custom design program will bring your creation to life. When you are investing in such a long-lasting and permanent piece as a high-end fine rug, settling for less should not be an option. You should be able to find the perfect design for your space. Alyshaan offers powerful design tools, premium service and quality in fine custom rugs. The design is entirely up to your imagination. We feature here custom rugs before and after images to showcase the rug design entered into the software and the final ‘after’ version produced, along with pictures from the homes of our wonderful clients who agreed to let us show how the custom rugs look when finally placed. DESIGN: You choose a design from our 5000+ rugs https://alyshaan.com/rugs/ or a design you already have or have seen; you can even sketch a design and send it to us or describe to us what you want and we will send you some design options. SIZE: You then decide the size you need, and our expert staff can assist you with this decision. PRICE: We then explain the different weaves the design can be made in and options of different materials and quote you prices for these different possibilities. A magnificent feature of our custom rugs program is that it doesn’t cost anything extra to custom order a rug, compared to the price of the same rug if it was in stock. DESIGNING THE RUGS: Once you place the order, our graphic designers make any changes you may want to the design you have chosen to tweak it based on your comments. STRIKE OFF: We then produce a small rug that is approximately an 18” x 18” portion of the rug that represents the colors best, for your final approval. PRODUCTION: Once the strike off is approved, the rug is produced and we send our clients pictures of the rug in the production process and after it is finished. DELIVERY: We have the rug shipped to our showroom for a vigorous inspection process and then the rug is delivered or shipped to the client with a high-quality pad. TIME: On average, a room size rug will take between 2 to 4 months, depending on the weave and other factors. You can use our specialized software to design your own rug, but because this process has a learning curve and can get frustrating, we highly recommend that you allow our expert staff to do the designing for you based on your instructions.